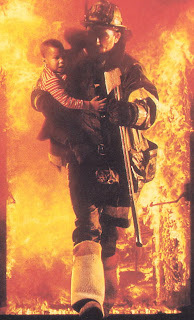 I have a firefighter brother and one thing he hates are firefighter movies. The dramas of barreling fireballs and station house antics are too phony for him to bear. 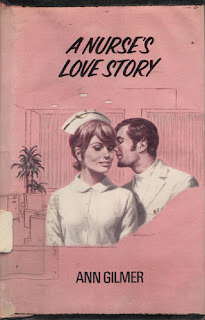 Many doctors cringe at the fakery in celluloid hospital scenes. We still see scrub nurses patting down the sweaty brows of surgeons when in fact operating rooms are kept at chilly temperatures. I wonder if teachers shake their heads, bewildered, at Hollywood's version of real classrooms. I recently caught an old chestnut on television, UP THE DOWN STAIRCASE, with a thirty-year-old Sandy Dennis as a first-year high-school teacher at a troubled New York City institution. I mention her age because, in her dewy freshness, Ms. Dennis is utterly appealing and devoid of the neurotic tics she picked up over the course of her career. I found her entirely believable in her intelligent and well thought-out performance. 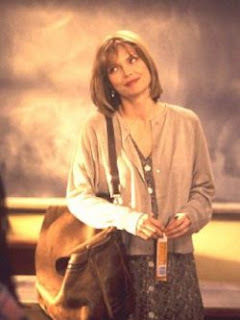 I loved that during the time frame of the story, one school year, she wears three different outfits over and over. I so appreciated the diversity of the school's population. I cheered the filmmakers' restraint when a "bad boy" isn't saved and redeemed by our heroine. This is a good movie. On the other hand, DANGEROUS MINDS which aired a few nights later, is devastating in its posturing and cliché-laden imagery. That tough nut, Michelle Pfeiffer, licking her lips for what seems like half an hour as she challenges the tough ghetto kid to do better. It's so stupid it's agonizing to watch. Seriously? Does anyone think that's a wise choice in disciplining a teenager, especially when he looks twenty-six and you look like Michelle Pfeiffer? 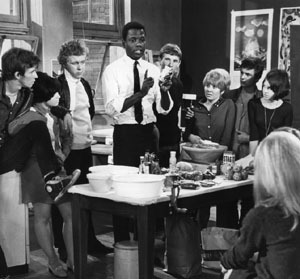 I will always have a soft-spot for TO SIR WITH LOVE, also released in 1967, and starring Sidney Poitier. For one thing, until "Stand and Deliver" showed up, it was the only film I'm aware of where the star teacher isn't white. Also, I saw this movie when I was a kid and wept buckets at the ending. 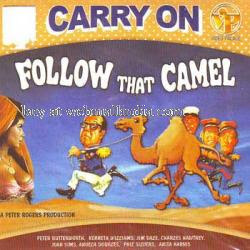 I missed this one but I bet it's great: FOLLOW THAT CAMEL. with Phil Silvers.